Sidewinder UK has for many years offered Sidewinders® as a method of surfacing footpaths and cycle ways with only limited success. Despite achieving the required tolerances and being able to outperform any other laying process we have struggled to overcome the perception that all material laid in paths and cycle ways must be machine laid, by which it is determined that heat and vibration must be applied. This is however not the fact as we all know more paths are hand laid than machine laid due to accessibility issues and on that basis alone the argument fails. However here at Sidewinder UK although we do not currently offer heat we have been making steps to overcome some of the issues raised and have now included hydraulic vibration and screed augers to assist the movement and compaction of material. 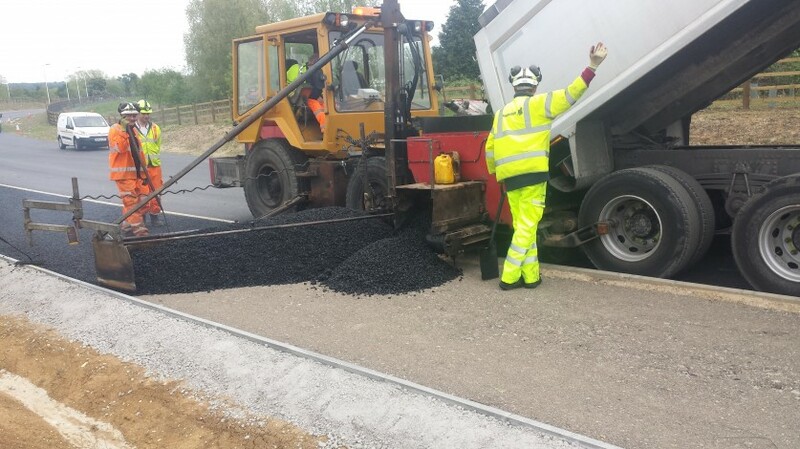 One of our Sidewinders® was recently commissioned by Toppersfield Ltd and Carney Construction via Hoctief UK on the Shinfield bypass near Reading. Work commenced in May 2016 and required us to place subbase 150mm thick followed by binder and wearing course to a 2.5 meters wide. The contract was championed by Dale Wilson of Toppersfield based on our ability to reduce program and save money without compromising quality and was given the thumbs up by all concerned and further contracts are now in negotiation. Additional information regarding this contract and others can be found on our Facebook page alternatively you can visit our services page for a full list of services offered on our web page.